One of the things I love about being a Stampin' Up! Demonstrator is being able to say thank you to my customers. 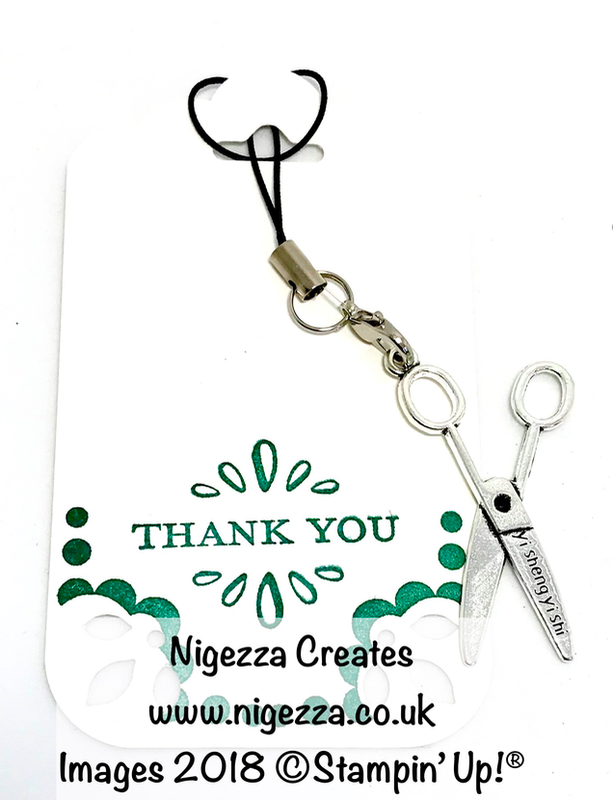 Its also really lovely to hear how much they enjoyed receiving their thank you gift. Every month I make a thank you cards and a little hand made gift for every one who has shopped with me the previous month. If they have used my host code then they also receive a share of the stampin' rewards, so will get some FREE product. This month I made everyone a scissor charm and a cute little tag and holder to present it in. I have previously shared the card I made. With the long side to the top of your score board score @ 3 3/4" & 4"
Tranquil Textures Designer Series Paper - Mats 3 1/2" x 1 7/8" & 1 3/4" x 1 7/8"
I am editing this post to add the links to the charms I bought, it took me a while to remember! Now you have gathered the materials, click below so you can craft along with me! Details below of my shop. See you again soon with another tutorial.